I started the new year with a burst of energy. Turns out I don't "spring clean", I "put Christmas away and New Year clean like a boss!" And with my studio/office clean and re-organized, I was able to get back to making art. I was on fire until Erin decided to share her cold with me. She's a giver. But before that, I had pulled out the encaustic materials and made half a dozen pieces! And for me, who has a love/HATE relationship with melted wax, that is a win! It helped that I was doing photo encaustic pieces and transfers. I even pulled the silk screen printing I was doing into the mix! And low and behold, one of those pieces made it into the Sierra Wax Artist's annual juried Member Show - Cross Pollination! This year's show is so strong! I am so proud to be a part of this amazing, talented, and fun group of artists. 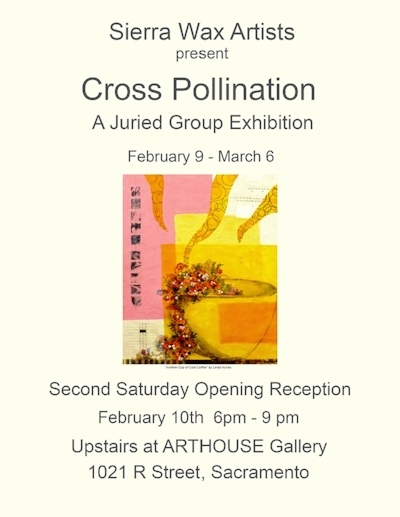 Be sure to check it out at Arthouse on R.
And because encaustics are hot right now (sorry), 2 other galleries in the building are also featuring encaustic pieces! So swing by Studio 10 and Sparrow Gallery while you are there, you won't be disappointed.